The stunning Harrod Roman Garden Arch in Silk Grey is a real garden statement, manufactured to the same high standards as our popular Roman Garden Arch but powder coated in a beautiful and subtle silk grey finish. 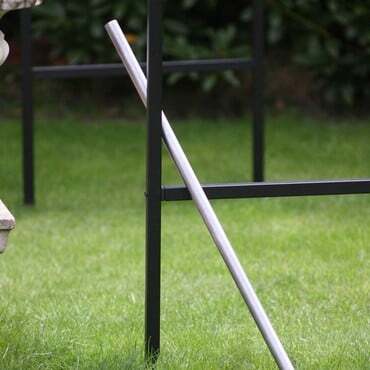 0.60m/ - 1ft 11" 1.05m/ - 3ft 5" 1.55m/ - 5ft 1"
Following the success of our traditional Roman Garden Arches with matt black finish, we have added the contemporary silk grey finish to make your metal garden arch a real garden focal point. 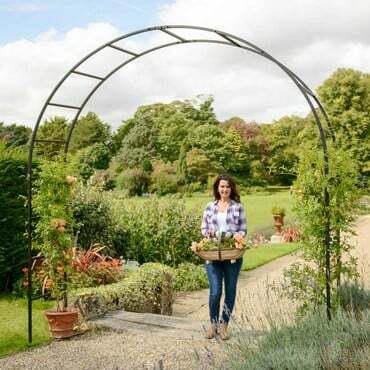 The Roman Style Garden Arch is particularly suitable for climbing ornamentals, vegetables, fruit trees and often used as rose arches. 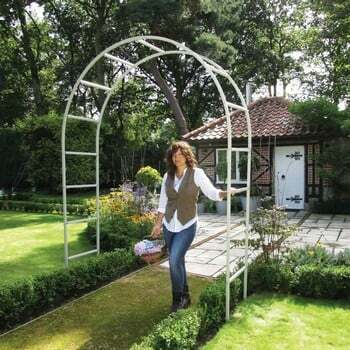 Why not create a beautiful garden walkway by using multiple arches to create a stunning tunnel effect in your garden. 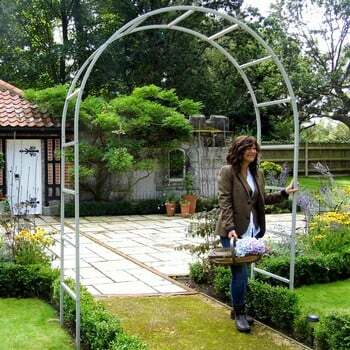 The Roman Garden Arch in silk grey is manufactured to exceptionally high standards using pre-galvanised extra strength 1.5mm thick x 25mm square steel which is then powder coated silk grey. The RHS endorsed Arch framework is secured with strong internal galvanised steel brackets and stainless steel fixings. The Arch is available in 4 sizes from 1.2m/3ft 11" to 2.5m/9ft 8" Wide and 2.29m/7ft 6" to 2.95m/9ft 8" High and all are available in 3 depths - 0.6m/2ft, 1.05m/3ft 5" and 1.55m/5ft 11". 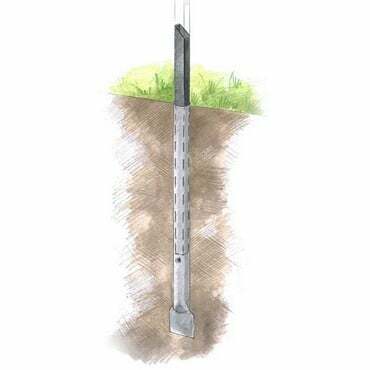 Each arch is designed to be installed directly into the soil (we've provided an additional 40cm on each upright to secure into the ground along with optional floor fixing pins). 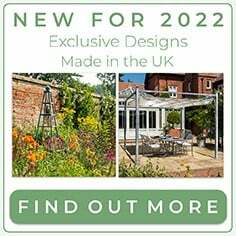 With the RHS endorsement and a 10 year structural guarantee, you can be sure the Roman Garden Arch in Silk Grey will prove to be a valuable feature in your garden for many years. 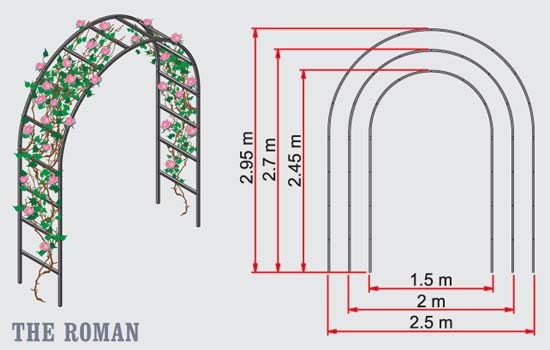 Each width arch is available in 3 depths - 0.6m/2ft, 1.05m/3ft 5", 1.55m/5ft 11"
We are here to help with your Garden Arch Project and can offer a complete Made to Measure Service if you can't see the ideal size or colour for your garden. 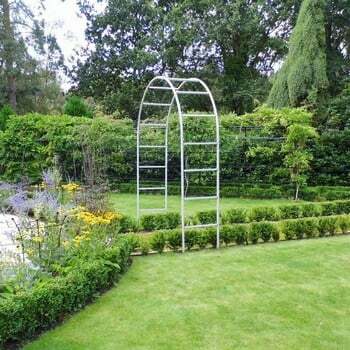 Our Expert Design Team have previously created a Roman garden arch with pillars as a wonderful entrance to a garden, in a bespoke design. 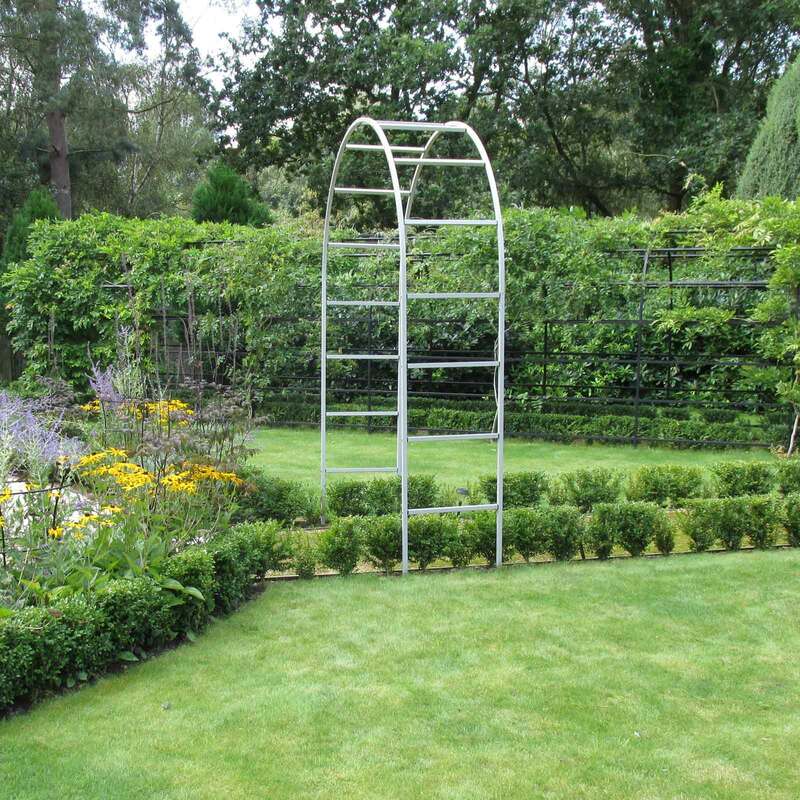 Our Roman Arches are simple yet stunningly attractive and just made for creating a tunnel effect or walkway. 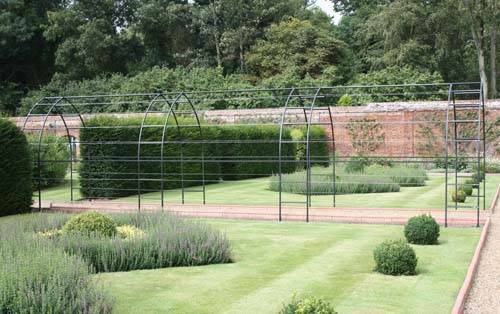 Like the other arches in our RHS-endorsed Superior Garden Arch Range - the Gothic and Ogee - the Roman Garden Arches are perfect for training all climbing ornamentals, fruit and vegetables. A breathtaking floral arch walkway is an ideal way to gracefully lead from one section of the garden to another. By choosing to link individual arches together, up to a distance of 3.5 metres between each one, you can achieve the visual impact of a tunelled effect from only 30% extra. Distances can be covered cost effectively by linking multiple arches at up to 3.5m distance between each one using 3 connector bars and a 2mm diameter multi-strand galvanised steel cable plant support system. This achieves a tunnelled effect using less metal than a pergola which features a rack of uprights and connecting bars throughout. Specify the size of the arch and the number of individual arches you require. 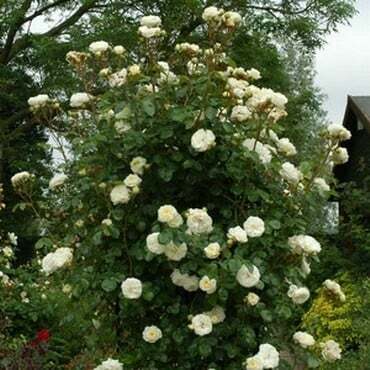 Measure the length of garden space you wish to cover. To link individual arches together we use 3 connector bars made from the same 1.5mm thick x 25mm square, black powder coated galvanised steel section used on the arches themselves. In addition, each tunnel is fitted with lines of 2mm diameter high strength galvanised multi-strand steel cable that run to a maximum of 3.5m between each arch. 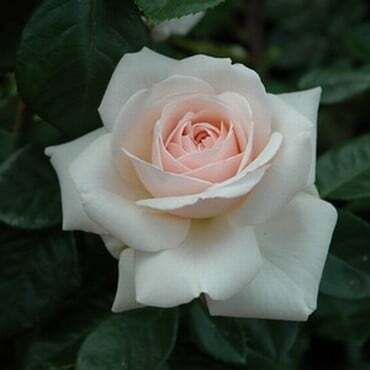 This cable passes through stainless steel eyelets to offer an incredibly strong and attractive support system to train all forms of climbers you choose to clothe the walkway with. The image above shoes 4 individual gothic arches, each measuring 2m wide x 2.77m high and 60cm deep, covering an overall length of 10m. Our Expert Design Team have previously created a Roman garden arch with pillars as a wonderful entrance to a garden, in a bespoke design. 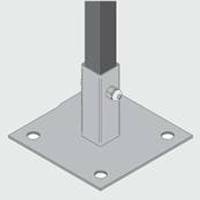 Installing your arch on hard ground or concrete?